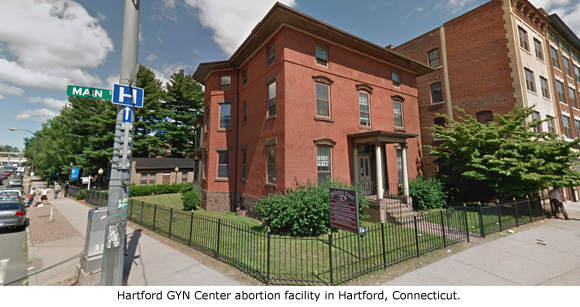 Hartford, CT – An abortion patient suffered “excessive bleeding” in the middle of an abortion procedure at Hartford GYN Center in Hartford, Connecticut, according to 911 records obtained by Operation Rescue. A 911 call was placed by “Madeline,” a Hartford GYN nurse, at 10:01 a.m. on October 21, 2017. She indicated that the patient was in the middle of a “procedure” and was bleeding heavily. The woman was sedated, and it appeared that the clinic staff were going to under sedation while they continued the abortion procedure. EMS unit 221 transported the bleeding woman to Hartford Hospital. The entire incident took 22 minutes. Further information about the injured woman’s condition remains unknown. Hartford GYN Center opened in 1981, and conducts abortions through 21 weeks of pregnancy. It is a member of the National Abortion Federation, a network of abortion facilities that has an over-all dubious safety record. The abortion business is part of a chain of five facilities operating under the Women’s Centers banner. Other chain locations are in Atlanta, Georgia; Cherry Hill, New Jersey; Delaware County, Delaware; and Philadelphia, Pennsylvania. From January 1 through November 18, 2017, Operation Rescue documented 56 medical emergencies nationwide that required ambulance transport directly from abortion facilities. This number is based on eye-witness reports and does not reflect every incident that occurs. It also does not count women who must seek emergency medical care after they have left the abortion facility. Operation Rescue tracks abortion-related medical emergencies at abortion facilities nationwide. Read the 911 CAD printout.